You will earn 1,257 Reward Points. Earn 1 reward point for every 1 dollar spent. Natural lava rock briquettes provide superior heat distribution and vaporize drippings. Available in 15", 24", 36" and 48" widths to fit many foodservice operation space requirements. Heavy-duty 4” inch adjustable legs to match the height of other Star-Max equipment in your line. Stainless steel, 2-3/4” high tapered splash guard provides maximum protection against grease and spills. Gas convertible in the field with conversion kit supplied with each char-broiler. Units are shipped Natural Gas. Star-Max® lava rock gas char-broilers are designed for the most demanding foodservice applications. Star-Max char-broilers deliver maximum performance and provide years of operation. Designed with high performance 40,000 BTU H-style cast iron burners every 12” of width. Cast iron burners provide excellent broiling performance, better heat distribution and maximum sectional control. Heavy-duty cast iron grates can be individually positioned (flat or slanted) to accommodate a variety of broiling needs. Grates are reversible with a thin side for searing and a thick side for more delicate menu items. Star-Max® lava rock char-broilers are designed for high volume and reliability. Whether it’s chicken, hamburger, steak, shish kabobs or any other items, Star’s countertop char-broiler will fulfill your menu requirements. Can be converted to radiant style in the field. Cooking surface consists of heavy duty, cast iron grates adjustable to flat or slanted positions. Double wall aluminized steel side panels with cast iron burners every 12 inches, adjustable valves and standing pilot are standard. Star-Max® line of lava rock char-broilers feature stainless steel cool to the touch front panel, bull nose, drip pan, splash guard and grease trough. Star-Max® lava rock char-broilers are covered by Star’s TWO YEAR parts and labor warranty. Gas char-broilers are constructed with stainless steel front panel and double wall aluminized steel side panels. Units are 40,000 BTU natural (35,000 BTU propane) cast iron burner for every 12" (30.5 cm) of width and are con trolled by an ad just able valve. Lava rock briquettes provided for even heat dis tri bu tion. Cooking surface is heavy-duty cast iron grate-type and is ad just able in height. A stainless steel water pan is provided. Control knobs are protected by a stainless steel bull nose front. A standing pilot is pro vid ed. 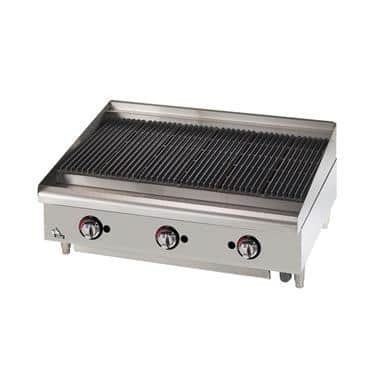 Char-broilers are supplied with 4" (10.2 cm) high die cast nickel plated legs with a 1-3/8” (3.5 cm) adjustment. Gas connection is 3/4" N.P.T. male and a convertible pressure regulator is provided. Units are UL Gas Certified for U.S. and Canada. UL sanitation approved. Printed in the U.S.A.